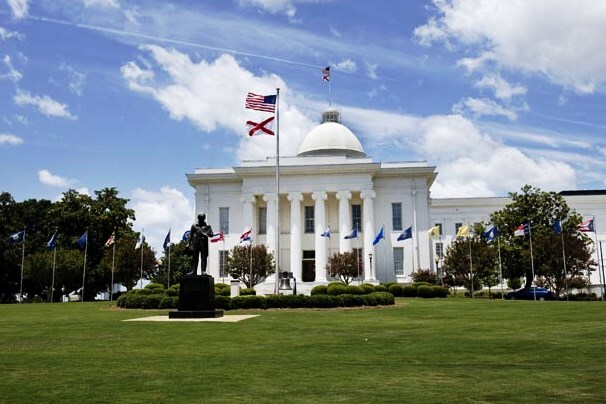 Alabama became a state December 14, 1819, the 22nd state admitted to the Union. On the portico of the capitol a bronze star marks the spot where Jefferson Davis was inaugurated President of the Confederate States of America on February 18, 1861. From Montgomery went the telegram “Fire on Ft Sumter” that began the Civil War. Montgomery today is home to the nation’s first Civil Rights Memorial, chronicling the events of the struggle for racial equality between 1955-1968. From Dexter Avenue Baptist Church Martin Luther King Jr directed the bus boycott that sparked the civil rights movement. Montgomery has many distinctive historic houses and buildings. The State Capitol was built in 1851. Old Alabama Town includes houses, barns, carriage houses, log cabins, churches, stores, and a cotton gin from the 1800’s. Scott Fitzgerald and wife Zelda lived in Montgomery in the 1930’s; view artifacts, pictures and their famous love letters in the museum. And the grave of country music legend Hank Williams is adjacent to Oakwood Cemetery. The walk of flags on the capitol grounds that honors all 50 states, the wide open parks and the cotton heritage, the telling of the civil war and civil strife; the struggles and the overcoming days, the big broad Dexter Avenue. Mountains near: Talladega Mountains of the Blue Ridge. Cheaha Mountain in the eastern part of the state is the highest point in Alabama at 2,413 feet.